We are lucky to live in a place where a major part of the community is deeply rooted in Christ fellowship. People of all walks of life move to Houston and bring their faith with them, each contributing to the community of Christ in a unique and special way. At The Apple Tree School, we believe that children have an incredible impact on the local Christian community, and it is private Christian schools like us that can help them flourish and grow in God’s image. Each of our experienced Christian school teachers have found their way through our doors as a way of combining two things they are incredibly passionate about: the Lord and early childhood education. Through their Christian teachings that combine traditional core curricula with Bible verses, artistic expression, and other fun educational activities that engage developmental milestones, our teachers and their students have found great academic success. We owe it all to the local Christian community we are blessed to be a part of. One amazing thing about the Houston community and the local churches and schools within it is the genuine Christian fellowship we are able to share. Whether it is through church services, small groups, youth groups, or Christian elementary schools like ours, there are always opportunities to congregate and share your journey of faith with others. Here at The Apple Tree School, we practice this by encouraging our students to pray for one another and learn life lessons through Bible verses and spiritual songs. Over the years, we have found that this helps children form healthy friendships through their interactions with others in the community of Christ while becoming more engaged in learning critical skills such as mathematics, reading, writing, and geography. For us, it all comes down to serving the Lord in everything we do, including fundamental early childhood education coursework. Central to the Christian religion is love — love for God, love for others, and love for yourself. 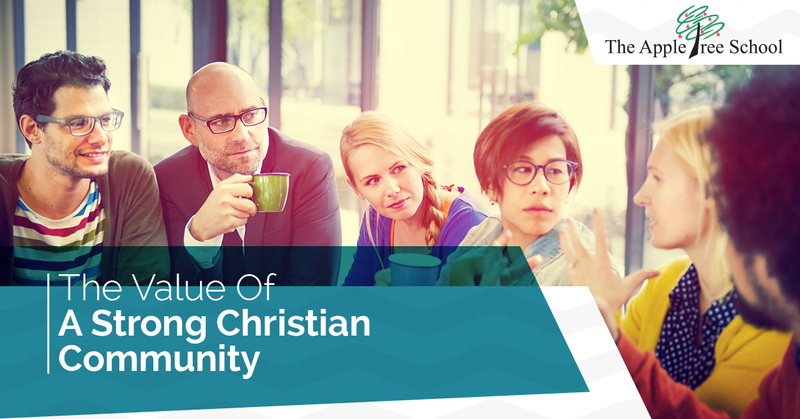 If you are part of Houston’s Christian community, you have likely already experienced the fulfilling life changes that come with loving your neighbor as yourself. By immersing yourself in the community of Christ, you have an entire congregation of friends, family, and colleagues to support you through whatever challenges life throws your way — and vice versa. Love is at the heart of everything we do here at The Apple Tree School, from the songs, dances, and other activities of cultural exploration to the fundamentals of math, science, english, and social studies our students explore. Our Christian teachers express love for their students every single day by providing them with the individualized attention and genuine care they need to thrive, both in academics and in life. Without love and a strong Christian community for support, we wouldn’t be able to accomplish any of the things we do at The Apple Tree School. If you are looking for an early childhood education center that your child will learn and thrive in, consider enrolling them at The Apple Tree School. We offer a range of accelerated Christian curriculum for different age groups, including infants, preschoolers, kindergartners, and first and second graders. Click here to learn more about our course material, and don’t forget to check out our summer learning programs for preschoolers and elementary-age students. We would love to hear from you if you have any questions about our curricula or our staff, so please don’t hesitate to give us a call. Our Christian teachers are always welcoming to newcomers and love forming new connections within Houston’s Christian community, so we look forward to hearing from you! ©2018 The Apple Tree School - Do not copy. All rights reserved.